The Ravine is Phil’s book — we read it as he types it, in the basement apartment he’s called home since his wife kicked him out for having an affair with a make-up girl. As he writes, and then corrects what he’s written, we hear how he went from promising young playwright to successful, self-hating TV producer. We listen in on his disastrous late-night phone calls, and watch his brother (once a brilliant classical pianist) weep to himself as he plays Ravel and Waltzing Matilda in a desolate bar. The Ravine tells us all about the influence of The Twilight Zone on Phil’s work and his life — how it helped him meet his wife Veronica and then lose her, and how it led to the bizarre death of his friend, TV star Edward Milligan. Sometimes, when Phil’s drunk, a friend will look at what he’s written so far and call him on it — like when Jay tells Phil that he’s remembered it all wrong: that he was just as good as Phil at tying knots back when they were in the cubs. Phil’s “ravine” is his attempt to make sense of things, to try to understand how everything went so wrong just as it seemed to be going so right. 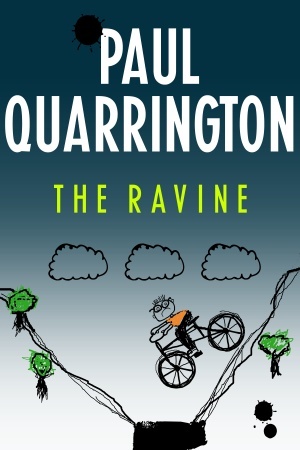 But The Ravine is also a Paul Quarrington novel, meaning that it’s hilarious and ingenious, quietly working its magic until the reader is at once heartbroken and hopeful. A darkly funny story about loss and redemption, The Ravine is also about how stories are made — how they can pull us out of disasters that seem too much for anyone to bear — and about how, sometimes, what we need to forgive ourselves for is not what we think it is at all.